Last year’s Umbrella Painting workshop was so much fun. Let’s do it again! 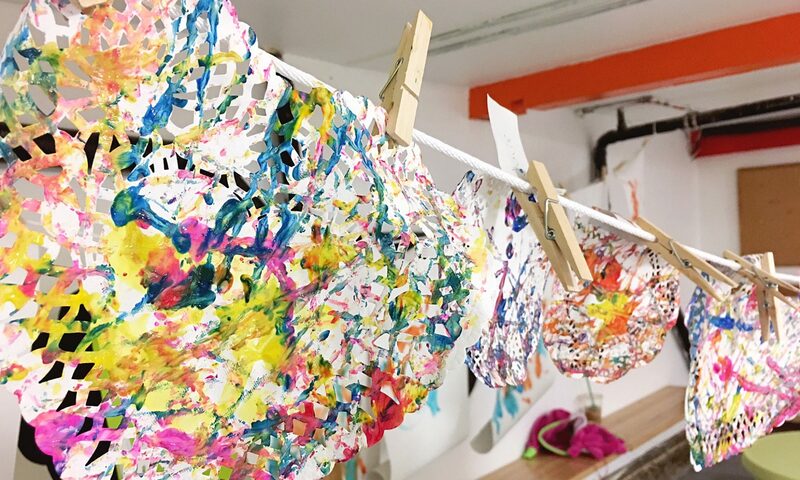 Each young artist will paint an umbrella of their very own to brighten up their rainy days. We will be using fabric paint and yes, they will be functional! Mexican Tin Heart Mirrors: Valentines Workshop! In the spirit of Valentines Day, we will be making beautiful Mexican Tin Heart Mirrors (aka. hojalata)! This is quite a unique project and a rare opportunity for kids to learn about how to make this special folk art that is rich in Mexican cultural tradition. Personally, I happen to LOVE the way this craft looks and you and your kids will too! I’m throwing out a day and time here that works for me and I am hoping that the people who would like to participate are available. Let me know if it does. Ages 4-10 yrs. As usual, snacks provided. WORKSHOP IS FULL. PLEASE CONTACT ME TO BE ADDED TO WAITLIST. Winter 2019 Class Registration is Open! Messy Makers’ Preschool Class is starting up again in the Fall! Why should your child do process art?